An overseas-based Guyanese who came home for his mother's funeral was on Saturday night robbed by two armed men of a quantity of jewellery along with foreign and local currency. The two men who wore masks pounced upon Abdul Amin Ganie and two other persons who were under his house at Goed Banana Land, East Canje, Berbice. Ganie also known as `Baker' was relieved of all his jewellery which included gold chains, bands and finger rings, Canadian $3000 and US$2000 and $5000 in Guyana currency. Veena Ramrattan, who resides at the house with her husband Terry Bacchus when Ganie is away, was also relieved of her finger rings including her wedding ring. 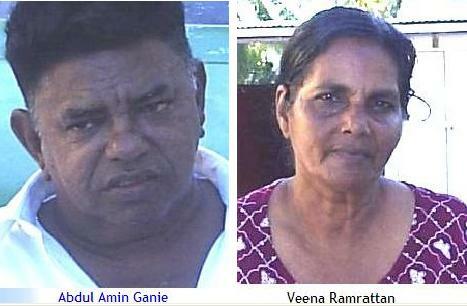 According to Ganie, he was at home under his house with his friend Brijmohan Sarwan and Ramrattan. He was lying on a bed while Ramrattan was sitting in one hammock and his friend in another when the men came up. The men who came from the back of the house, placed guns to the head of Ganie and Sarwan and made Ramrattan lie flat on the ground. They then commanded them not to move or speak. Scared for his life, Ganie said he told them to take what they wanted. The men then proceeded to strip him of his jewellery and his pants which contained the money. After the men left they all started shouting for help and called for the police who arrived less than fifteen minutes after.